High denitrification and anaerobic ammonium oxidation contributes to net nitrogen loss in a seagrass ecosystem in the central Red Sea Nitrogen removal by seagrasses Neus Garcias-Bonet et al. Nitrogen loads in coastal areas have increased dramatically, with detrimental consequences for coastal ecosystems. 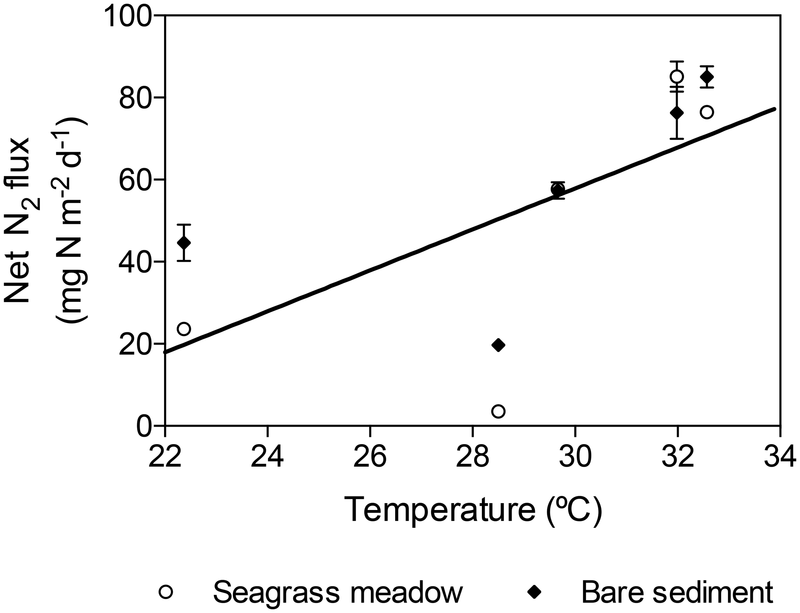 Shallow sediments and seagrass meadows are hotspots for denitrification, favoring N loss. However, atmospheric dinitrogen (N2) fixation has been reported to support seagrass growth. Therefore, the role of coastal marine systems dominated by seagrasses in the net N2 flux remains unclear. Here, we measured denitrification, anaerobic ammonium oxidation (anammox), and N2 fixation in a tropical seagrass (Enhalus acoroides) meadow and the adjacent bare sediment in a coastal lagoon in the central Red Sea. We detected high annual mean rates of denitrification (34.9±10.3 and 31.6±8.9 mg N m−2 d−1) and anammox (12.4±3.4 and 19.8±4.4 mg N m−2 d−1) in vegetated and bare sediments. The annual mean N loss was higher (between 8 and 63-fold) than the N2 fixed (annual mean = 5.9±0.2 and 0.8±0.3 mg N m−2 d−1) in the meadow and bare sediment, leading to a net flux of N2 from sediments to the atmosphere. Despite the importance of this coastal lagoon in removing N from the system, N2 fixation can contribute substantially to seagrass growth since N2 fixation rates found here could contribute up to 36 % of plant N requirements. In vegetated sediments, anammox rates decreased with increasing organic matter (OM) content, while N2 fixation increased with OM content. Denitrification and anammox increased linearly with temperature, while N2 fixation showed a maximum at intermediate temperatures. Therefore, the forecasted warming could further increase the N2 flux from sediments to the atmosphere, potentially impacting seagrass productivity and their capacity to mitigate climate change but also enhancing their potential N removal. Garcias-Bonet, N., Fusi, M., Ali, M., Shaw, D. R., Saikaly, P. E., Daffonchio, D., and Duarte, C. M.: High denitrification and anaerobic ammonium oxidation contributes to net nitrogen loss in a seagrass ecosystem in the central Red Sea, Biogeosciences, 15, 7333-7346, https://doi.org/10.5194/bg-15-7333-2018, 2018. Nutrient supply is an important driver of marine primary production (Field et al., 1998; Howarth, 1988), where nitrogen (N) availability is believed to exert a key role in regulating net primary production (Howarth, 1988) and driving eutrophication (Howarth and Marino, 2006) in coastal ecosystems. Anthropogenic activities have led to a doubling of the global amount of fixed N, with important changes in ecosystem productivity, diversity, air quality, and, ultimately, climate (Fowler et al., 2013; Vitousek et al., 1997). Whereas natural atmospheric dinitrogen (N2) fixation is globally estimated at 203 Tg N yr−1 (from which 140 Tg N yr−1 occurs in marine systems), the anthropogenic contribution to new N supply has been estimated at 210 Tg N yr−1, mainly produced by N2-fixing crops, combustion of fossil fuels, and the Haber–Bosch industrial reaction (Fowler et al., 2013). Coastal areas receive high inputs of fixed N by river and groundwater discharges and atmospheric deposition (Galloway et al., 2003; Voss et al., 2013), causing severe problems related to eutrophication and, potentially, dystrophic crisis (Galloway et al., 2003; Herbert, 1999). High N inputs can be partially balanced through losses, as coastal marine sediments are hotspots of denitrification (Devol, 2015), the conversion of nitrates and nitrites to N2 (and N2O partially), leading to the loss of fixed N. Globally, coastal denitrification has been estimated to range from 4 to 8 Tg N yr−1 (Voss et al., 2013), which is modest compared to the global riverine input of 66 Tg N yr−1 (Seitzinger et al., 2005), N2 fixation of about 15 Tg N yr−1 (Voss et al., 2013), and atmospheric deposition of 1 Tg N yr−1 (Voss et al., 2013) to the coastal ocean. Recently, however, anaerobic ammonium oxidation (anammox), the chemoautotrophic conversion of ammonium and nitrite to N2, has also been regarded as an important process in marine sediments. It has been estimated to account for from nearly zero up to 80 % of the total N loss in sediments (Dalsgaard et al., 2005; Devol, 2015). Within the coastal ocean, seagrass ecosystems support high rates of N2 fixation (McGlathery, 2008), particularly in tropical and subtropical ecosystems (Welsh, 2000; Herbert, 1999). Nitrogen supplied by N2 fixation can account for up to 90 % of plant nutrient requirements (Hansen et al., 2000). It has been suggested that seagrasses have a close mutualistic relationship with N2-fixing bacteria inhabiting the rhizosphere (Herbert, 1999) and roots (Garcias-Bonet et al., 2016), where bacteria would benefit from root exudates and plants would benefit from fixed N supply. However, seagrass ecosystems also support high denitrification rates (Eyre et al., 2011b) and have been identified as key habitats for N loss in temperate (Eyre et al., 2016) and sub-tropical (Eyre et al., 2011a) estuaries. 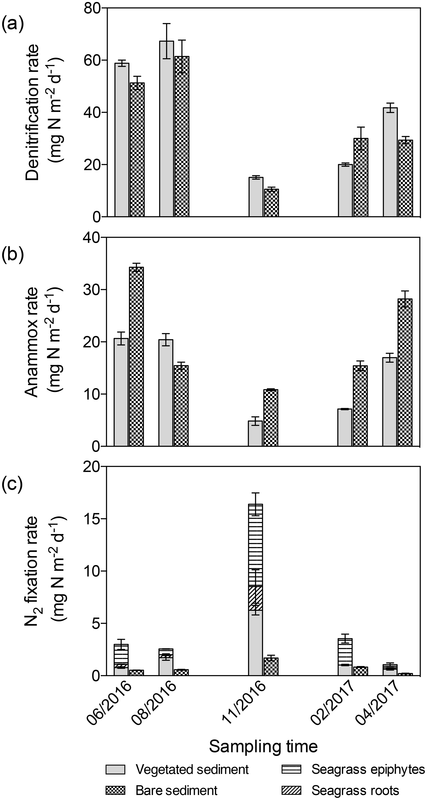 Although anammox rates have not been assessed for seagrass sediments as yet, Salk et al. (2017) recently reported very low anammox rates (0.18 µmol N m−2 h−1), despite accounting for 74 % of N loss, on bare sediment adjacent to a Zostera muelleri meadow in a sub-tropical estuarine system. Therefore, the role of seagrass ecosystems as net sinks or sources of N remains unclear. Welsh et al. (2000) reported very low denitrification rates compared to N2 fixation rates in a temperate intertidal seagrass meadow, whereas denitrification seems to exceed N2 fixation in tropical (Alongi et al., 2008) and sub-tropical (Eyre et al., 2011a) seagrass ecosystems. The balance between transformations of inert atmospheric N2 and reactive N in seagrass ecosystems is an important driver of their net N budget (Hemminga et al., 1991), particularly in areas with limited N inputs from land. This is the case for seagrass meadows in arid regions lacking riverine inputs, such as the Red Sea, characterized by general oligotrophic conditions in surface waters (Raitsos et al., 2013; Weikert, 1987). 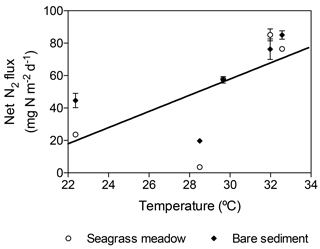 Nitrogen cycling in seagrass ecosystems is mediated by complex microbial communities requiring specific physicochemical conditions, which may ultimately determine the balance between transformations of inert atmospheric N2 and reactive N. Seagrass meadows offer patchy sediment conditions, affected by the release of organic exudates and oxygen by seagrass roots (Pedersen et al., 1998), as well as the activity of burrowing infauna, which facilitates the exchange and diffusion of nutrients and allows the oxygenation of deep sediment layers (Welsh, 2003). These processes contribute to high spatial heterogeneity in seagrass sediments, therefore, modifying the redox potential (Enriquez et al., 2001) and allowing for the co-occurrence of processes requiring different environmental conditions (Herbert, 1999; Hemminga et al., 1991). Here, we test the following hypotheses: (i) that seagrasses and bare sediments in a coastal lagoon in the Red Sea are net N2 sources and (ii) that the loss of reactive N from sediments to the atmosphere increases with temperature. Specifically, we assess the annual balance between losses of reactive N as N2, via denitrification and anammox, and gains of reactive N, by N2 fixation, in a tropical seagrass (Enhalus acoroides) meadow and the adjacent bare sediment in a coastal lagoon located in the central Red Sea. We first describe the environmental conditions in the sediments, based on microprofiles of oxygen (O2), sulfide (H2S), and redox, and then evaluate denitrification, anammox, and N2 fixation rates in seagrass sediments and adjacent bare sediments. In addition, we analyze the thermal dependence of denitrification, anammox, and N2 fixation throughout the annual in situ thermal range. The Red Sea is one of the warmest seas and is warming faster than other seas (Chaidez et al., 2017), thereby offering an opportunity to assess if the balance between losses of reactive N as N2, via denitrification and anammox, and gains of reactive N by N2 fixation, may be affected by warming. The study was conducted on an Enhalus acoroides seagrass meadow in Khor Almesena'a, a shallow enclosed coastal lagoon located in the central Red Sea (22∘23′23.2′′ N, 39∘08′08′′ E). The study site was a monospecific seagrass meadow at 2 m depth and the adjacent (about 5 m from the edge of the seagrass meadow) bare sediment. The study was conducted between June 2016 and April 2017. We assessed sediment microprofiles (O2, H2S, and redox) and denitrification, anammox, and N2 fixation rates across five sampling events, two in summer (June and August 2016), one in the fall (November 2016), one in winter (February 2017), and one in spring (April 2017). At each sampling time, we also monitored and recorded salinity and seawater temperature in situ every 10 min for 24 h using an EXO1 Multiparameter Sonde (YSI, USA). At each sampling event, we performed O2, H2S, and redox microprofiles on vegetated sediments and adjacent bare sediment reaching an average depth of 7 cm below the sediment surface, using the field microprofiling system by Unisense (Aarhus, Denmark). At each sampling event, we collected four sediment cores (40 cm in length and 10 cm in diameter, two replicate cores per each sediment type) containing at least 15 cm of undisturbed sediment. The cores were transported immediately to the laboratory and the microprofile analysis started within the next 3 h. Oxygen microsensors (Ox-200), with a tip diameter of 200 µm, were calibrated in sterile water at oxygen partial pressures of 0 and 21 kPa. For H2S measurements, we used H2S-200 microelectrodes (200 µm tip diameter). Calibration of the microsensors was performed following manufacturer specifications and following Seitaj et al. (2015). Redox measurements were performed using Redox-200 microelectrodes (200 µm tip diameter). The electrode potential in the sediment was measured against the Unisense Ag–AgCl reference electrode and the calibration was performed using two quinidrone solutions (10 mg mL−1) buffered at pH 4 and 7, respectively. Microsensors were positioned using a manual micromanipulator (Märzhäuser, Wetzlar, Germany), and the tip position was visually controlled with a horizontally mounted USB stereomicroscope (Veho VMS-004). Oxygen, H2S, and redox microprofiling measurements started 10 min after embedding and lasted about 4 h per sediment core. The sediment surface position was adjusted using the software Sensor Trace Suite v2.7.100 (Unisense, Aarhus, Denmark). The microprofiles were performed under light and dark conditions per triplicate. The cores were left for 12 h under dark conditions before starting the microprofiles under dark conditions. We measured denitrification and anammox rates with a batch incubation experiment with 15N-labeled nitrogen compounds in vegetated sediment and the adjacent bare sediment. At each sampling event, we collected six cylindrical plastic cores (40 cm length and 5 cm in diameter, three replicate cores per each sediment type) containing at least 15 cm of undisturbed sediment. The cores were transported immediately to the laboratory. Denitrification and anammox rates were measured at three sediment horizons: from sediment surface to 1 cm deep, from 1 to 2 cm deep and from 2 to 3 cm deep. A 15N isotope pairing technique was applied for measurement of N-related activities. The principle and procedure for measuring N2 production via anammox were essentially based on a 15N-tracer incubation method reported elsewhere (Thamdrup and Dalsgaard, 2002). However, in this study, we used a simpler method developed previously (Amano et al., 2011; Yoshinaga et al., 2011). Briefly, about two grams of sediment was dispensed into 10 mL glass serum vials, which were sealed with butyl rubber stoppers and aluminum caps. All these procedures were performed in an anaerobic chamber (Coy Laboratory Products, Grass Lake Charter Township, MI), where O2 concentration was <1 ppm. Headspace in the vials was exchanged with highly pure He gas (>99.9999 %) by vacuuming and purging. Positive pressure (50–75 kPa) was added to the headspace to prevent unintentional contamination with ambient air during the incubation and gas sampling. The vials containing oxygen-free sediment suspensions were pre-incubated overnight in the dark to eliminate the remaining substrates. Four different combinations of 15N labeled and/or unlabeled substrates were supplemented from anoxic stock solutions to these pre-incubated vials: (1) 0.5 mM 15NH4Cl (≥98 atom % 15N, Sigma-Aldrich, Inc.); (2) 0.5 mM 15NH4Cl and 0.5 mM Na14NO2 (Sigma-Aldrich, Inc.); (3) 0.5 mM Na15NO2 (98 atom % 15N, Sigma-Aldrich, Inc.); and (4) 0.5 mM K15NO3 (98 atom % 15N, Sigma-Aldrich, Inc.). The concentration of the 15N-labeled and unlabeled substrate was chosen as suggested previously (Amano et al., 2007). The vials were incubated under anoxic conditions at in situ temperature. The concentrations of 29N2 and 30N2 gas were determined by gas chromatography-mass spectrometry (GC-MS) analysis at different intervals as described previously (Isobe et al., 2011a, b). In combination with GC inlet and peak integration software, a quadrupole MS system can be used to determine N2 production rates <10 nmol N L−1 d−1 (Holtappels et al., 2011). A total of 50 µL of headspace gas were collected using a gas-tight syringe (VICI; Baton Rouge, LA, USA), immediately injected into a GC (Agilent 7890A system equipped with a CP-7348 PoraBond Q column) combined with 5975C quadrupole inert MS (Agilent Technologies; Santa Clara, CA, USA). The m/z=29 and 30 values were monitored at the same retention time for each measurement. The amounts of 29N2 and 30N2 gas were determined using a standard curve prepared with 30N2 standard gas (>98 % purity; Cambridge Isotope Laboratories; Tewksbury, MA, USA). The potential denitrification and anammox rates were estimated from the production of 29N2 and 30N2 using the equations (provided in Supplement) described previously (Holtappels et al., 2011; Yoshinaga et al., 2011). All the batch tests were performed in triplicate. Finally, the denitrification and anammox rates were standardized to surface area integrating 3 cm sediment depth by averaging the rates measured at different horizons and taking into account the sediment bulk density. We measured N2 fixation by Acetylene Reduction Assay (Capone and Taylor, 1980) in seagrass roots, seagrass shoot epiphytes, vegetated sediment, and adjacent bare sediment. At each sampling time, we carefully collected shoots containing roots and placed them in zip-lock plastic bags. The shoots were immediately transported to the laboratory in a cooler box protected from sunlight. We also collected six cylindrical plastic cores (40 cm length and 10 cm in diameter, three replicate cores per each sediment type) containing at least 15 cm of undisturbed sediment. The sediment cores were transported immediately to the laboratory. Once in the laboratory the roots were carefully separated from shoots and rinsed with sterilized seawater. Then we placed 10 g (fresh weight) of healthy roots in a 250 mL glass bottle. Similarly, we placed one shoot (without roots) in a 500 mL glass bottle. We added 100 and 250 mL of fresh seawater collected from the same location to the root and shoot samples, respectively, and the bottles were closed with lids fitted with gas-tight valves. In parallel, the sediment from the cores was extruded carefully using a plunger, and the sediment was cut in four different horizons: from sediment surface to 1 cm deep, from 1 to 2 cm deep, from 2 to 3 cm deep, and from 9 to 10 cm deep. We added the additional deeper sediment layer (9 to 10 cm), matching the maximum depth at which seagrass roots were detected. For each horizon, 80 mL of sediment was placed in a 500 mL glass bottle. Then we added 200 mL of fresh seawater collected from the same location and the bottles were closed with a lid fitted with a gas-tight valve. Finally, we added acetylene-saturated seawater, prepared according to Wilson et al. (2012), through the gas-tight valve in order to achieve a final acetylene concentration of 4 mM (10 mL to roots and 20 mL to shoots and sediment incubations). The acetylene was added in the form of acetylene-saturated seawater to reduce the acetylene equilibration time and, therefore, avoid potential underestimation of ethylene production rates (Wilson et al., 2012). We ran the root and shoot incubations in triplicate. Similarly, we run the sediment incubation in triplicate for each horizon and sediment type. The roots and sediment slurries were incubated under dark conditions, and the shoots were incubated mimicking the natural photoperiod (12 h light at 200 µmol photons m−2 s−1: 12 h dark) at in situ temperature. We sampled the headspace five times, distributed across the 24 h incubations. Specifically, we withdrew 3 mL of air from the headspace with a gas-tight syringe. The headspace air sample was immediately injected into a 3 mL vacuum vial for further analysis of ethylene concentration on a gas chromatographer equipped with a flame ionization detector and coupled to a mass spectrometer (MS-FID-GC, Agilent 7890) using a GS-CarbonPLOT column (60 m × 320 µm × 1.5 µm, Agilent Technologies, USA). We built a calibration curve using three ethylene standards of known concentration (1.5, 9, and 93 ppm) and helium as a balance gas, supplied by Abdullah Hashim Industrial Gases & Equipment Co. Ltd. (Jeddah, Saudi Arabia). We estimated the concentration of dissolved ethylene before equilibrium with the headspace, from the ethylene concentration in the equilibrated air according to Wilson et al. (2012) and applying the solubility coefficient of ethylene extracted from Breitbarth et al. (2004) as a function of temperature and salinity. We run the following negative controls at each sampling event: (i) roots, shoots, and sediment without addition of acetylene-saturated seawater in order to confirm that ethylene was not naturally produced by our samples, and (ii) seawater collected from the study site and used in the preparation of the incubations with addition of acetylene-saturated seawater in order to measure the N2 fixation due to pelagic diazotrophs. The ethylene production rate measured in the seawater control was subtracted from the ethylene production rates detected in our samples. The net ethylene rates (after subtracting the background seawater rate) were converted into N2 fixation rates by applying the common ratio of 3 mol of acetylene : 1 mol of N2 (Welsh, 2000). At the end of the incubation, we dried the roots, shoots, and sediment samples at 60 ∘C and recorded the dry weight for further calculations. Moreover, we calculated the sediment organic matter (OM) content of each replicate sediment horizon by loss on ignition (Dean Jr., 1974). Then the sediment N2 fixation rates were standardized to surface area integrated over 3 cm sediment depth by averaging the rates measured at the first 3 sediment horizons and taking into account the sediment bulk density in order to compare N2 fixation to denitrification and anammox rates. The N2 fixation rates of roots and shoot epiphytes were standardized to surface area taking into account the biomass density. Differences in OM content (our continuous response variable) were tested considering the categorical explanatory variables “sediment type” (2 levels: vegetated and bare sediments) with the non-parametric Wilcoxon test. Furthermore, we analyzed OM content considering also as explanatory variable “sediment horizons” (4 levels: from sediment surface to 1 cm deep, from 1 to 2 cm deep, from 2 to 3 cm deep, and from 9 to 10 cm deep), and “sampling events” (5 levels: June, August, November, February, and April) by performing a generalized linear model (GLM) and considering their interaction. All the factors were fixed and orthogonal. Differences in O2 concentration and H2S concentration between vegetated and bare sediments and between light and dark were tested by nonparametric Wilcoxon test. Differences in denitrification, anammox, and N2 fixation rates per gram of sediment along the sediment horizons between vegetated and bare sediments were tested by Wilcoxon matched-pairs signed rank test. Similarly, we test for differences between denitrification, anammox, and N2 fixation rates by Wilcoxon matched-pairs signed rank test. Moreover, we analyzed the difference in denitrification, anammox, and N2 fixation rates per gram of sediment considering the type of sediment and the sediment OM content as our categorical and continuous explanatory variables, respectively. Since the distribution of denitrification, anammox, and N2 fixation rates per gram of sediment was not normal, we used a GLM to test for differences. Finally, we analyzed the difference in depth-integrated denitrification, anammox, and N2 fixation rates, our continuous response variables, considering the type of sediment and sampling event as our categorical explanatory variables. We furthermore analyzed the difference in depth-integrated denitrification, anammox, and N2 fixation rates, considering the type of sediment and temperature as our categorical and continuous explanatory variables, respectively. Since the distribution of the depth-integrated denitrification and N2 fixation rates was not normal, we used a GLM to test for differences, while we used a linear model test to analyze the depth-integrated anammox rates as its distribution was normal. The effect of temperature and sediment type on the net N2 flux was tested by using a linear model. All statistical analyses were performed using JMP (SAS Institute Inc., USA) and PRISM (GraphPad Software Inc., USA) statistical software. The in situ daily average seawater temperature ranged from 22.3∘ C in February to 32.5∘ C in June (Table 1), while annual mean salinity was 41.2±0.4 PSU. The OM content was consistently higher (about 40 % higher) in the vegetated sediments compared to the bare sediment (nonparametric Wilcoxon test, p<0.0001), with annual mean (± SEM) OM content of 13.5±0.1 and 8.5±0.1 % of sediment dry weight, respectively, and decreased with increasing depth (Fig. 1a). The sediment OM content significantly differed among sediment type, sampling event, and sediment horizon (GLM; sediment type × sampling event × sediment horizon χ12,802=28.7; p=0.004). The maximum depth-integrated mean OM content in vegetated sediments (15 % of sediment dry weight) and bare sediments (9.5 % of sediment dry weight) was found in November and June, respectively. Table 1Annual variation of in situ seawater temperature. Mean seawater temperature values are daily averages of in situ seawater temperature and temperature range indicate daily oscillations (minimum–maximum). Seawater temperature was recorded every 10 min over 24 h for each sampling event. Figure 1Characterization of Enhalus acoroides seagrass vegetated sediments and adjacent bare sediments at five sampling times throughout the year. (a1–a5) Sediment organic matter content in vegetated (green dots) and bare (orange dots) sediment horizons. (b1–b5) Vegetated sediment O2 microprofiles under light (red) and dark (blue) incubations and H2S microprofiles during light (yellow) and dark (brown) incubations (no data available for H2S profiles on the last sampling). (c1–c5) Bare sediment O2 microprofiles under light (light red) and dark (dark red) incubations and H2S microprofiles under light (yellow) and dark (brown) incubations (no data available for H2S profiles on the last sampling). Sediment O2 microprofiles significantly differed between vegetated and bare sediments during light and dark measurements (nonparametric Wilcoxon test, p=0.0002 and p<0.0001, respectively) and between light and dark conditions in both vegetated and bare sediments (nonparametric Wilcoxon test, p<0.0001 and p<0.0001, respectively). The vegetated and bare sediments were anoxic below the sediment surface but the sediment depth at which anoxic conditions prevailed varied depending on sediment type, light or dark conditions, and the time of the year (Fig. 1b, c). In vegetated sediments, the anoxic conditions appeared at deeper layers than in the bare sediments. Similarly, O2 diffused into deeper sediment layers during light incubations than during dark incubations for both vegetated and bare sediments. On average, the vegetated sediments were anoxic at 1±0.3 and 0.7±0.1 cm below the surface under light and dark conditions, respectively, while bare sediments were anoxic at 0.6±0.2 and 0.4±0.1 cm below the surface under light and dark conditions, respectively. In some vegetated sediments under light conditions (Fig. 1b1, b3), the O2 concentration increased again at deep layers, likely indicating O2 release by seagrass roots into the sediment or O2 diffusion through animal burrows. Sediment H2S microprofiles were highly variable across the year (Fig. 1b, c). Under light conditions, the H2S concentration in bare sediments (median = 1.28 µmol H2S L−1) was significantly higher than in vegetated sediments (median = 0 µmol H2S L−1) (nonparametric Wilcoxon test, p<0.0001). Similarly, under dark conditions, the H2S concentration in bare sediments (median = 1.17 µmol H2S L−1) was significantly higher than in vegetated sediments (median = 0.008 µmol H2S L−1) (nonparametric Wilcoxon test, p<0.0001). In vegetated sediments, the H2S concentration was very low (<0.5 µM) during the summer months (June and August, Fig. 1b1–b2) and the maximum H2S concentration (10.4 µM) was detected in November under dark conditions (Fig. 1b3) at 2.2 cm below the sediment surface. Bare sediments showed similar H2S profiles under light and dark conditions, except for the dark measurement in November. The maximum H2S concentration in bare sediments (15.2 µM) was also detected in November under light conditions, but it was higher than that in vegetated ones and at deeper sediment layers (Fig. 1c3), about 6 cm below the surface. The redox potential ranged from about 550 to −450 mV (Fig. S1 in the Supplement) and decreased abruptly with increasing sediment depth. Figure 2Sediment profiles of denitrification, anammox and N2 fixation rates at five sampling times. (a1–a5) Sediment denitrification rates in vegetated (red) and bare (red square pattern) sediment horizons. (b1–b5) Sediment anammox rates in vegetated (orange) and bare (orange square pattern) sediment horizons. (c1–c5) Sediment N2 fixation rates in vegetated (blue) and bare (blue square pattern) sediment horizons. Error bars indicate SEM. Sediment denitrification rates per gram of sediment were consistently higher in vegetated sediments compared to bare sediments (Wilcoxon matched-pairs signed rank test, p=0.0015, Fig. 2a). The highest denitrification rates were detected in summer (June and August, Fig. 2a1–a2) for both vegetated and bare sediments. In vegetated sediments, the maximum denitrification rate (20.52±0.6 nmol N g DW−1 h−1) was found in June and was almost twice the maximum rate measured in bare sediments (11.5±4.2 nmol N g DW−1 h−1), which was found in August. Although the rates varied throughout the year, the maximum denitrification rates took place between 1 and 2 cm below the surface, with minimum rates detected in the sediment surface. Anammox rates per gram of sediment were consistently lower than denitrification rates (Wilcoxon matched-pairs signed rank test, p<0.0001) and without significant difference between vegetated and bare sediments (Wilcoxon matched-pairs signed rank test, p=0.6788, Fig. 2b). In vegetated sediments, the maximum anammox rate (6.88±0.5 nmol N g DW−1 h−1) was detected in August and was similar to the maximum rate in bare sediments (6.89±0.4 nmol N g DW−1 h−1), measured in April. The minimum denitrification and anammox rates were measured in November. Sediment N2 fixation rates per gram of sediment (Fig. 2c) were significantly lower than denitrification and anammox rates (Wilcoxon matched-pairs signed rank test, p<0.0001 and p<0.0001, respectively), with maximum N2 fixation rates (1.25±0.1 nmol N g DW−1 h−1) detected in November, in contrast to the denitrification and anammox patterns. The N2 fixation rates were significantly higher in vegetated sediments than those rates measured in bare sediments (Wilcoxon matched-pairs signed rank test, p<0.0001, Fig. 2c). Denitrification rates per gram of sediment differed between vegetated and bare sediments at different sediment horizons, however sediment OM content did not have a significant effect (GLM; sediment type χ1,282=5.6, p<0.05; OM content χ1,282=3.1, p=0.08) (Fig. 3a). The sediment OM content and the type of sediment had a significant effect on anammox rates (GLM; sediment type χ1,282=4.5, p<0.05; OM content χ1,282=5.1, p<0.05) and N2 fixation rates (GLM; sediment type × OM content χ1,362=14.2, p<0.001). 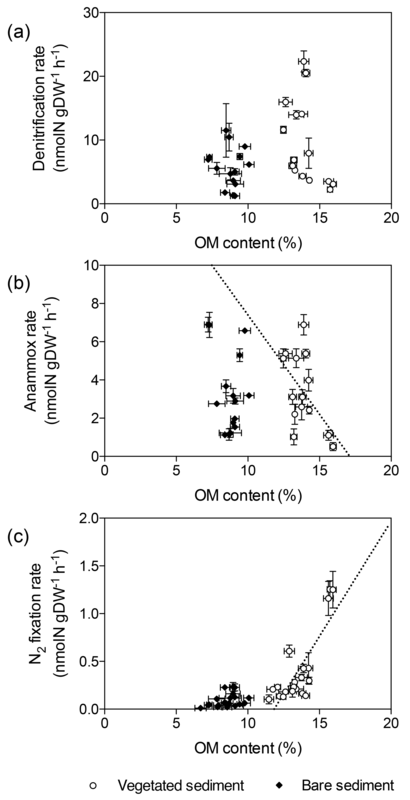 Anammox rates decreased with increasing OM content in vegetated sediments (Y=-1.04X+17.8, p<0.05, Fig. 3b), while N2 fixation rates increased with increasing OM content in vegetated sediment (Y=0.24X-2.9, p<0.0001, Fig. 3c). Figure 3Relation of denitrification, anammox, and N2 fixation rates with sediment OM content. (a) Denitrification rates in vegetated sediments (white dots) and bare sediments (black diamonds). (b) Anammox rates in vegetated (white dots) and bare (black diamonds) sediments, showing the linear decrease of anammox rates in vegetated sediments with increasing OM content (dotted line) (c) N2 fixation rates in vegetated sediments (white dots) and bare sediments (black diamonds), showing the linear increase of N2 fixation rates in vegetated sediments with increasing OM content (dotted line). Error bars indicate SEM. The differences in denitrification rates between vegetated and bare sediment rates became smaller when depth-integrated (0–3 cm) rates were compared (Fig. 4a), largely due to the higher (1.5-fold) bulk density in bare sediments compared to vegetated sediments. Depth-integrated denitrification rates significantly differed among sampling events but not between vegetated and bare sediments (GLM; sampling event χ4,242=70.6, p<0.0001; sediment type χ1,242=3.1, p=0.08), with minimum rates observed in November in both sediment types. Depth-integrated anammox rates (Fig. 4b) significantly differed among sampling events and between vegetated and bare sediments (lm, sampling event × sediment type; F4,29=30.05, p<0.0001). Minimum depth-integrated anammox rates were detected in November in both sediment types; however, rates were consistently higher in bare sediments compared to vegetated sediments throughout the year. Similarly, depth-integrated N2 fixation rates (Fig. 4c) significantly differed among sampling events and between vegetated and bare sediments (GLM; sampling event × sediment type χ4,202=73.31, p<0.0001), with consistently higher rates in vegetated sediments. Maximum depth-integrated N2 fixation rates were observed in November in both types of sediments. Figure 4Area integrated sediment rates throughout the year. (a) Denitrification rates in vegetated (gray) and bare (square pattern) sediments. (b) Anammox rates in vegetated (gray) and bare (square pattern) sediments. (c) N2 fixation rates in vegetated (gray) and bare (square pattern) sediments, in seagrass roots (angled stripes), and epiphytes (horizontal stripes). Error bars indicate SEM. Temperature had a significant effect on depth-integrated denitrification rates regardless of the type of sediment (GLM; temperature χ1,272=16.67, p<0.0001; sediment type χ1,272=0.53, p=0.46). 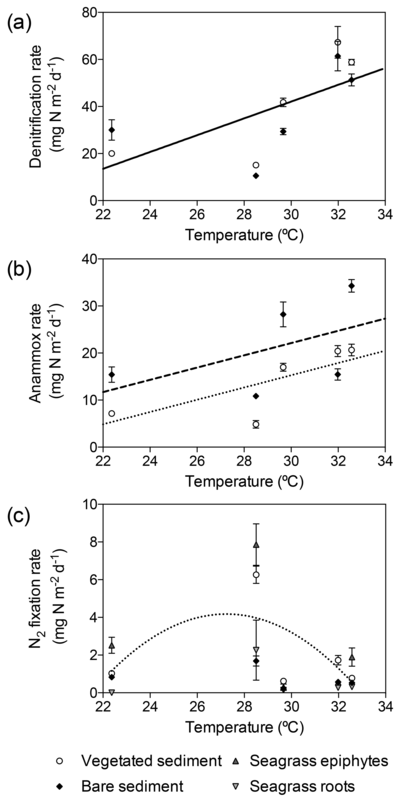 Depth-integrated denitrification rates increased linearly with temperature (Y=3.569X-65, Fig. 5a). Temperature and sediment type had a significant effect on depth-integrated anammox rates (lm; temperature F1,29=14.8, p=0.0007; sediment type, F1,29=7.7, p=0.01), with rates increasing linearly in vegetated (Y=1.3X-20.36) and bare (Y=1.3X-16.94) sediments (Fig. 5b). However, depth-integrated N2 fixation rates did not increase linearly with temperature and the differences in rates were explained by sediment type (GLM; sediment type χ1,272=4.93, p=0.03). Sediment N2 fixation rates in vegetated and bare sediments showed a different thermal response than denitrification and anammox processes, with maximum rates reported at 28.5 ∘C and decreasing rates at either lower and higher temperatures (Fig. 5c). N2 fixation rates followed a second-degree polynomial curve (Y=16.94-0.45X-0.13X2, r2=0.40, p<0.05) in vegetated sediments. N2 fixation rates in seagrass roots and epiphytes showed the same annual pattern that the rates reported for the rhizosphere. The maximum rates in seagrass roots (21.9±210.7 µg N g DW−1 d−1) and epiphytes (10.4±1.5 µg N g DW−1 d−1) were also recorded in November when in situ seawater temperature was 28.5 ∘C (Fig. 5c). 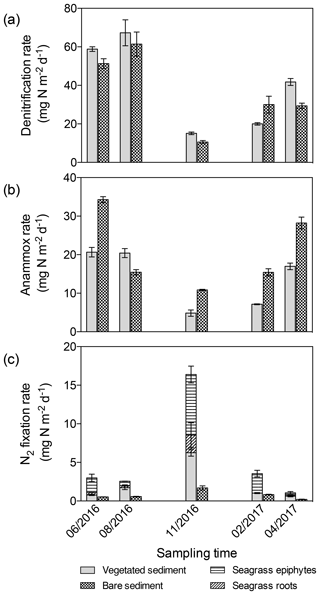 Figure 5Relation of denitrification, anammox, and N2 fixation rates to in situ seawater temperature. (a) Linear increase of denitrification rates (solid line) with temperature, showing denitrification rates in vegetated sediments (white dots) and bare sediments (black diamonds). (b) Linear increase of anammox rates in vegetated (dotted line and white dots) and bare (dashed line and black diamonds) sediments. (c) Thermal response of N2 fixation rates in vegetated sediments (white dots), bare sediments (black diamonds), seagrass epiphytes (triangles) and roots (upside down triangles), showing the fitted second-degree polynomial curve in vegetated sediment (dotted line). Error bars indicate SEM. The net N2 fluxes ranged from 3.6±0.8 and 19.73±0.9 mg N m−2 d−1 in November, to 85.1±3.7 and 85.1±2.6 mg N m−2 d−1 in summer months for the seagrass meadow and bare sediments, respectively (Fig. 6). The net N2 flux significantly differed among sampling events but not between sediment type (lm; sampling event F4,9=24.76, p=0.004; sediment type, F1,9=1.83, p=0.25). Net N2 flux increased linearly with temperature (Y=4.99X-91.86, r2=0.43, p<0.05, Fig. 7). Figure 6Net N2 flux in seagrass meadow (gray) and bare sediment (square pattern gray) throughout the year, considering sediment denitrification and anammox as N losses and sediment and seagrass roots and epiphytes N2 fixation as new N inputs. Error bars indicate SEM. Figure 7Linear increase (solid line) of net N2 fluxes in vegetated (white dots) and bare (black diamonds) sediments. Error bars indicate SEM. The sediment organic matter content in the Red Sea lagoon system studied here was extremely high, especially in the vegetated sediments (mean = 13.5 %), compared to the values reported for other seagrass sediments (mean = 4.1 %, Kennedy et al., 2010). The higher sediment organic matter content in vegetated sediments, compared to bare sediments, corroborates the evidence that seagrasses accumulate and store large amounts of organic carbon in their sediments (Duarte et al., 2005). In addition, seagrasses modified the physicochemical conditions of the sediment (Enriquez et al., 2001), as reflected in higher O2 and lower sulfide sediment concentrations than those in the adjacent bare sediment. Moreover, O2 profiles showed higher variability in vegetated sediments. This can be directly related to bioturbation (Kristensen et al., 2012) and to the radial oxygen loss by roots leading to oxic layers at depth (Pedersen et al., 1998), enhancing the complexity and heterogeneity of seagrass sediments. 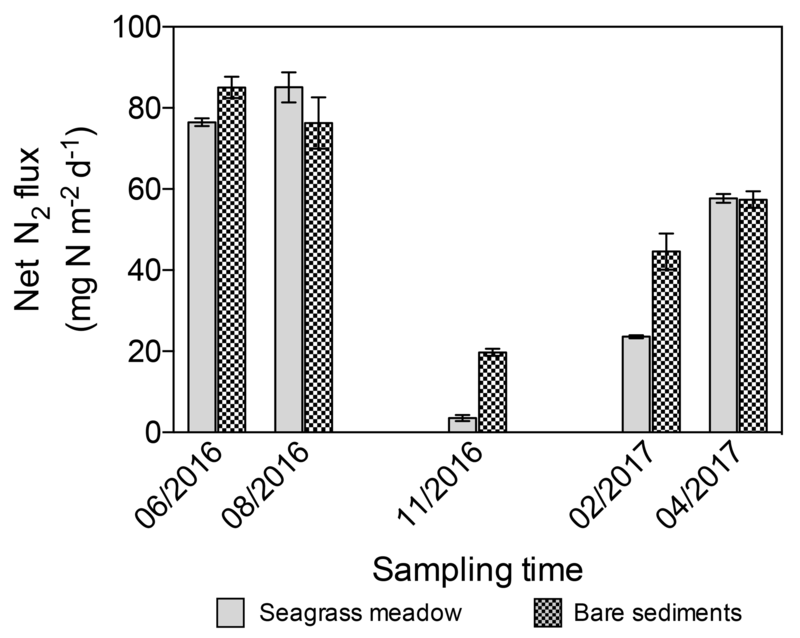 The denitrification rate in E. acoroides sediments reported here (annual mean = 34.9±10.3 mg N m−2 d−1) is a 6-fold increase over the rate reported for a restored Zostera marina meadow in Virginia using an in situ push–pull incubation method (Aoki and McGlathery, 2017), a 1.3 to 2.5-fold increase over the rate previously reported for tropical meadows dominated by E. acoroides on slurries from the top 5 cm sediment (Alongi et al., 2008), comparable to the rates reported for temperate seagrasses (Eyre et al., 2016), and 8-fold lower than the rates reported for sub-tropical estuarine seagrasses (Eyre et al., 2011a) using in situ benthic chambers. However, the use of the 15N isotope pairing technique on sediment slurries could have underestimated denitrification rates reported here. Measuring N2 fluxes on intact sediment cores has been proved to better account for coupled nitrification and denitrification than the 15N isotope pairing technique (van Luijn et al., 1996). In addition, sediment slurries disturb the sediment structure and redox gradient, and, therefore, might prevent the coupled nitrification and denitrification in the transition layers from oxic to anoxic conditions (Eyre et al., 2002; Herbert, 1999). Since the coupled nitrification and denitrification has been reported to be important in continental shelf and coastal sediments (Herbert, 1999; Gardner and McCarthy, 2009; Christensen et al., 1987); the denitrification rates in this coastal lagoon could be higher than actual reported values. Overall, the observed denitrification rates were higher in vegetated sediments than bare sediments when expressed per gram of dried sediment. However, we did not find differences between depth-integrated denitrification rates in vegetated and bare sediments (annual mean = 34.9±10.3 and 31.6±8.9 mg N m−2 d−1, respectively) contrary to previous findings (Eyre et al., 2011b). The potential sediment anammox rates reported here, ranging from 0.5 to 6.9 nmol N g DW−1 h−1, are comparable to potential anammox rates reported elsewhere (i.e., from 0 to 8 nmol N cm−3 h−1 in subtropical mangrove sediments (Meyer et al., 2005); from <0.5 to 7.6 nmol N g DW−1 h−1 in marine sediments from a fjord in Sweden (Brandsma et al., 2011) and from 0 to 3 nmol N cm−3 h−1 in sandy sediments in the southern North Sea; Bale et al., 2014). However, the potential sediment anammox rates detected here (annual mean depth-integrated anammox rates = 12.4±3.4 and 19.8±4.4 mg N m−2 d−1 in vegetated and bare sediments, respectively) are higher than the only estimate available, to the best of our knowledge, for a seagrass ecosystem (0.06 mg N m−2 d−1 in bare sediment adjacent to a sub-tropical seagrass meadow in Australia on intact cores; Salk et al., 2017). The contribution of anammox to the total loss of N reported here (27 % and 38 % in vegetated and bare sediments, respectively, Fig. S2) is smaller than the contribution reported by Salk et al. (2017), with anammox accounting for 64 % to 86 % of the total N loss, but still within the range of anammox-supported N losses reported for other marine sediments (Devol, 2015; Bale et al., 2014). The maximum N2 fixation rates reported for E. acoroides sediments here (6.3±0.5 mg N m−2 d−1) are lower than the previously reported maximum N2 fixation rates in sediments of a tropical mixed meadow dominated by E. acoroides (19.4±3.2 mg N m−2 d−1, Alongi et al., 2008). Similarly, Moriarty and O'Donohue (1993) reported higher N2 fixation rates for a mixed meadow dominated by E. acoroides (25±2.6 mg N m−2 d−1) than those reported here during the same time of the year (16.4±0.4 mg N m−2 d−1), although with a smaller contribution from leaf epiphytes (4.2±0.1 mg N m−2 d−1) compared with our N2 fixation rates from epiphytes (7.9±1.1 mg N m−2 d−1). The N2 fixation rates supported by roots are in agreement with previous findings of N2-fixing bacteria in association with seagrass roots (Garcias-Bonet et al., 2012, 2016). Moreover, the N2 fixation rates previously reported for surface-sterilized E. acoroides roots (0.13 mg N m−2 d−1; Raja et al., 2012) are 17-fold lower than the rates reported here (2.3±1.5 mg N m−2 d−1) for the same seawater temperature (29 ∘C), pointing out the role of bacteria inhabiting the rhizoplane of E. acoroides roots in nutrient supply. Despite the common use of the ARA to measure N2 fixation in natural communities, such as open ocean waters (i.e., Falcón et al., 2004) and vegetated coastal sediments (i.e., Eyre et al., 2011a), including seagrass sediments (see references in Welsh, 2000) and seagrass tissues (Nielsen et al., 2001; Raja et al., 2012), it has some methodological limitations that need to be considered. Acetylene is known to induce changes in the biogeochemistry and the microbial community composition in marine sediments, especially affecting sulfur- and sulfate-reducing bacterial groups (Fulweiler et al., 2015). However, the effect of acetylene is species specific, and, therefore, the N2 fixation rates reported here might be either under- or over-estimated and need to be carefully interpreted. The highest N2 fixation rates in vegetated and bare sediments coincided with the highest sediment sulfide concentrations (10.4 and 15.2 µmol H2S L−1 in vegetated and bare sediments, respectively), suggesting a contribution of sulfate-reducing bacteria to the pool of N2-fixing bacteria, as reported in other seagrass rhizospheres (Welsh et al., 1996). 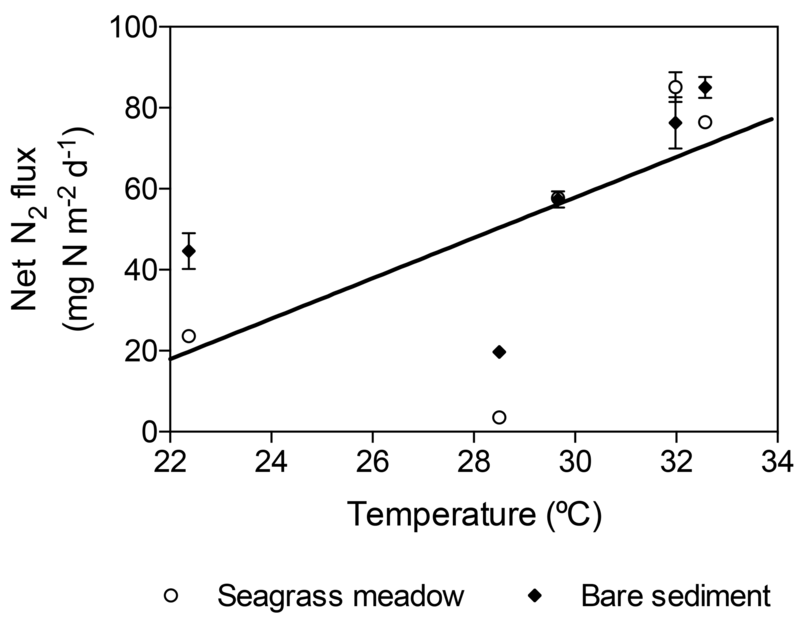 Although sulfide has detrimental effects on seagrasses (Garcias-Bonet et al., 2008), the sulfide concentrations in the vegetated sediments were generally below the threshold limit of 10 µmol H2S L−1 for seagrass decline (Calleja et al., 2007). The contrasting annual patterns in denitrification and anammox compared to those of N2 fixation, with the highest rates of denitrification and anammox in summer and spring while maximum N2 fixation in autumn, suggest differential specific thermal responses. The linear increase of denitrification and anammox with temperature found here was already described for net sediment N2 fluxes in estuaries (Nowicki, 1994). Similarly, the thermal response of N2 fixation found here, with maximum rates at intermediate temperatures (29 ∘C) and a decrease in rates at lower and higher temperatures, is in agreement with the notable decrease in N2 fixation rates at 33 and 35 ∘C reported for Mediterranean macrophytes (Garcias-Bonet et al., 2018) and cyanobacteria in soil crusts (Zhou et al., 2016), respectively. Moreover, these different annual patterns could be partially explained by changes in sediment OM. The sediment microbial activity is modulated, as well, by the quantity and quality of the OM. For instance, decomposition and remineralization rates of OM depends on its lability (Herbert, 1999) which is indicated by the C:N:P ratio that differs among sources (Enríquez et al., 1993). OM from phytoplankton decomposes faster than OM from seagrasses, due to their higher N content and therefore lower C:N:P ratios. Eyre et al. (2013) demonstrated that the source of the OM, and therefore, its C:N ratio controls denitrification rates in coastal sediments. Tibbles et al. (1994) showed an increase in sediment N2 fixation following the addition of complex plant polysaccharides and Fulweiler et al. (2013) argued that an increase in the C:N ratio of OM was responsible for the decrease in denitrification and the increase in N2 fixation, in agreement with the effect of OM reported here. The net N2 fluxes in the Red Sea lagoon ecosystem indicates this ecosystem supports a net loss of reactive N as N2 gas throughout the year, as sediment denitrification and anammox consistently exceeded N2 fixation in sediment and seagrass tissues. Alongi et al. (2008) also reported higher denitrification than N2 fixation rates in an E. acoroides meadow. Integrating the average seasonal rates, we estimate the annual N loss in 14.9 g N m−2 yr−1 in the seagrass meadow and 18.2 g N m−2 yr−1 in bare sediments. Despite the lack of rivers discharging into the Red Sea, the occasional heavy rains, groundwater discharge, and atmospheric deposition might lead to high reactive N loads reaching coastal systems (Voss et al., 2013). Therefore, the high denitrification and anammox rates in this coastal lagoon provide a mechanism adding resistance to excess N inputs (Zarnoch et al., 2017; Galloway et al., 2003), which might lead to permanent seagrass losses due to hypoxia after algal blooms produced by severe eutrophication (Herbert, 1999; Duarte, 1995). However, dissimilatory nitrate reduction to ammonium (DNRA) competes with denitrification by reducing nitrate availability. In a shallow estuary, DNRA was identified as an important nitrate loss pathway, with rates comparable to denitrification rates (An and Gardner, 2002); and in a restored Zostera marina meadow, DNRA accounted for 45 % of sediment nitrate reduction (Aoki and McGlathery, 2017). Therefore, the net N loss reported here could be lower due to a potential limitation of denitrification. Nevertheless, N2 fixation plays an important role in supporting seagrass meadows in the Red Sea, as the maximum N2 fixation rate reported here could contribute from 7 % to 36.4 % of the N requirements to support E. acoroides growth, calculated using previous estimates of biomass productivity (Alongi et al., 2008; Pedersen et al., 2016) and measured N content of leaf tissues in this central Red Sea lagoon (Almahasheer et al., 2017). Furthermore, the N isotopic composition reported for E. acoroides tissues in this location (δ15Nleaves=0.17 ‰ and δ15Nrhizomes=-1.56 ‰; Almahasheer et al., 2017), provides evidence for the atmospheric origin of the assimilated N.
The differential apparent thermal response of denitrification and anammox, which increased with increasing temperature, and N2 fixation, which showed a maximum at about 28 ∘C, leads to an increase in the net N2 flux with temperature (Fig. 6). This has important implications in a context of the rapid warming of the Red Sea (Chaidez et al., 2017). In particular, a further increase in temperature, with maximum temperatures in excess of 33 ∘C at present (Chaidez et al., 2017), might lead to a further imbalance in N cycling in tropical seagrass ecosystems, similar to that predicted for soil crusts (Zhou et al., 2016). Therefore, the forecasted warming might have an important impact on N availability and thus on seagrass productivity and their capacity to mitigate climate change. The studied coastal lagoon ecosystem supported a net loss of reactive N as N2, with anammox accounting for about one-third of N2 production. However, N2 fixation supported part of seagrass growth. The results presented suggest that, as a consequence of the differential thermal responses of processes supporting losses and gains of reactive N, future warming can enhance the role of seagrass meadows as sites of reactive N loss in the already warm Red Sea. Underlying data are provided in the Supplement. The supplement related to this article is available online at: https://doi.org/10.5194/bg-15-7333-2018-supplement. NGB and CMD designed the study. NGB and MF performed the fieldwork. NGB performed the N2 fixation measurements. MF performed the sediment microprofiles. MA and DRS performed the denitrification and anammox activity measurements. NGB, MF and CMD interpreted the results. NGB wrote the first draft of the paper. All authors contributed substantially to the final paper. This research was funded by King Abdullah University of Science and Technology through baseline funding to Carlos M. Duarte, Daniele Daffonchio, and Pascal E. Saikaly. We thank Mongi Ennasri for his support in sample analysis. Almahasheer, H., Serrano, O., Duarte, C. M., Arias-Ortiz, A., Masque, P., and Irigoien, X.: Low Carbon sink capacity of Red Sea mangroves, Sci. Rep.-UK, 7, 9700, https://doi.org/10.1038/s41598-017-10424-9, 2017. Alongi, D. M., Trott, L. A., Undu, M. C., and Tirendi, F.: Benthic microbial metabolism in seagrass meadows along a carbonate gradient in Sulawesi, Indonesia, Aquat. Microb. Ecol., 51, 141–152, https://doi.org/10.3354/ame01191, 2008. Amano, T., Yoshinaga, I., Okada, K., Yamagishi, T., Ueda, S., Obuchi, A., Sako, Y., and Suwa, Y.: Detection of anammox activity and diversity of anammox bacteria-related 16S rRNA genes in coastal marine sediment in Japan, Microbes Environ., 22, 232–242, 2007. Amano, T., Yoshinaga, I., Yamagishi, T., Van Thuoc, C., Ueda, S., Kato, K., Sako, Y., and Suwa, Y.: Contribution of anammox bacteria to benthic nitrogen cycling in a mangrove forest and shrimp ponds, Haiphong, Vietnam, Microbes Environ., 26, 1–6, 2011. An, S. and Gardner, W. S.: Dissimilatory nitrate reduction to ammonium (DNRA) as a nitrogen link, versus denitrification as a sink in a shallow estuary (Laguna Madre/Baffin Bay, Texas), Mar. Ecol.-Prog. Ser., 237, 41–50, 2002. Aoki, L. R. and McGlathery, K. J.: Push-pull incubation method reveals the importance of denitrification and dissimilatory nitrate reduction to ammonium in seagrass root zone, Limnol. Oceanogr.-Meth., 15, 766–781, 2017. Bale, N. J., Villanueva, L., Fan, H., Stal, L. J., Hopmans, E. C., Schouten, S., and Sinninghe Damsté, J. S.: Occurrence and activity of anammox bacteria in surface sediments of the southern North Sea, FEMS Microbiol. Ecol., 89, 99–110, 2014. Brandsma, J., van de Vossenberg, J., Risgaard-Petersen, N., Schmid, M. C., Engström, P., Eurenius, K., Hulth, S., Jaeschke, A., Abbas, B., and Hopmans, E. C.: A multi-proxy study of anaerobic ammonium oxidation in marine sediments of the Gullmar Fjord, Sweden, Env. Microbiol. Rep., 3, 360–366, 2011. Breitbarth, E., Mills, M. M., Friedrichs, G., and LaRoche, J.: The Bunsen gas solubility coefficient of ethylene as a function of temperature and salinity and its importance for nitrogen fixation assays, Limnol. Oceanogr.-Meth., 2, 282–288, 2004. Calleja, M., Marba, N., and Duarte, C. M.: The relationship between seagrass (Posidonia oceanica) decline and porewater sulfide pools in carbonate sediments, Estuar. Coast. Shelf S., 73, 583–588, 2007. Capone, D. G. and Taylor, B. F.: N2 FIXATION IN THE RHIZOSPHERE OF THALASSIA-TESTUDINUM, Can. J. Microbiol., 26, 998–1005, 1980. Chaidez, V., Dreano, D., Agusti, S., Duarte, C. M., and Hoteit, I.: Decadal trends in Red Sea maximum surface temperature, Sci. Rep.-UK, 7, 8144, https://doi.org/10.1038/s41598-017-08146-z, 2017. 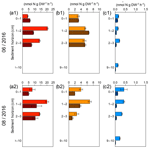 Christensen, J. P., Murray, J. W., Devol, A. H., and Codispoti, L. A.: Denitrification in continental shelf sediments has major impact on the oceanic nitrogen budget, Global Biogeochem. Cy., 1, 97–116, 1987. Dalsgaard, T., Thamdrup, B., and Canfield, D. E.: Anaerobic ammonium oxidation (anammox) in the marine environment, Res. Microbiol., 156, 457–464, https://doi.org/10.1016/j.resmic.2005.01.011, 2005. Dean Jr., W. E.: Determination of carbonate and organic matter in calcareous sediments and sedimentary rocks by loss on ignition: comparison with other methods, J. Sediment. Res., 44, 242–248, https://doi.org/10.1306/74D729D2-2B21-11D7-8648000102C1865D, 1974. Devol, A. H.: Denitrification, anammox, and N2 production in marine sediments, Annu. Rev. Mar. Sci., 7, 403–423, 2015. Duarte, C. M.: Submerged aquatic vegetation in relation to different nutrient regimes, Ophelia, 41, 87–112, 1995. Duarte, C. M., Middelburg, J. J., and Caraco, N.: Major role of marine vegetation on the oceanic carbon cycle, Biogeosciences, 2, 1–8, https://doi.org/10.5194/bg-2-1-2005, 2005. Enríquez, S., Duarte, C. M., and Sand-Jensen, K.: Patterns in decomposition rates among photosynthetic organisms: the importance of detritus C:N:P content, Oecologia, 94, 457–471, 1993. Enriquez, S., Marba, N., Duarte, C. M., van Tussenbroek, B. I., and Reyes-Zavala, G.: Effects of seagrass Thalassia testudinum on sediment redox, Mar. Ecol.-Prog. Ser., 219, 149–158, 2001. Eyre, B. D., Rysgaard, S., Dalsgaard, T., and Christensen, P. B.: Comparison of isotope pairing and N2: Ar methods for measuring sediment denitrification–assumption, modifications, and implications, Estuaries, 25, 1077–1087, 2002. Eyre, B. D., Ferguson, A. J. P., Webb, A., Maher, D., and Oakes, J. M.: Denitrification, N-fixation and nitrogen and phosphorus fluxes in different benthic habitats and their contribution to the nitrogen and phosphorus budgets of a shallow oligotrophic sub-tropical coastal system (southern Moreton Bay, Australia), Biogeochemistry, 102, 111–133, https://doi.org/10.1007/s10533-010-9425-6, 2011a. 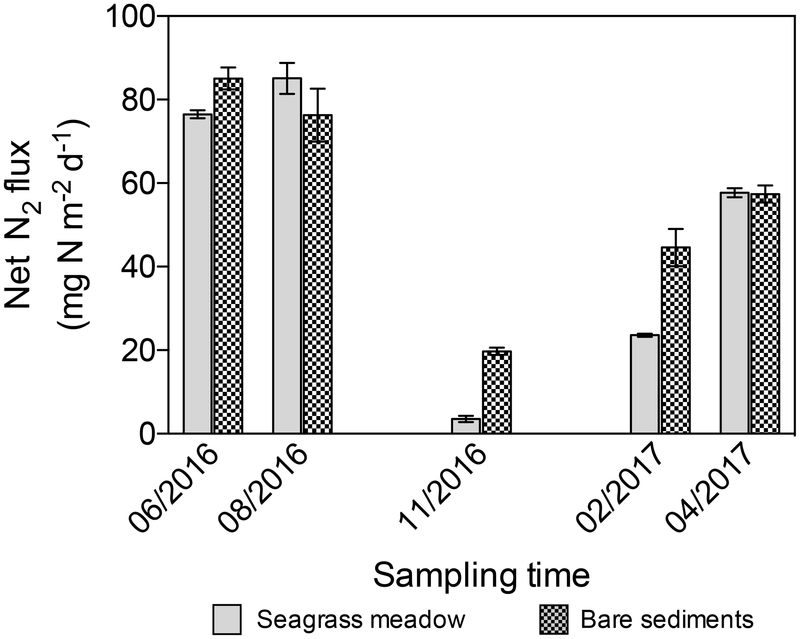 Eyre, B. D., Maher, D., Oakes, J. M., Erler, D. V., and Glasby, T. M.: Differences in benthic metabolism, nutrient fluxes, and denitrification in Caulerpa taxifolia communities compared to uninvaded bare sediment and seagrass (Zostera capricorni) habitats, Limnol. Oceanogr., 56, 1737–1750, https://doi.org/10.4319/lo.2011.56.5.1737, 2011b. Eyre, B. D., Maher, D. T., and Squire, P.: Quantity and quality of organic matter (detritus) drives N-2 effluxes (net denitrification) across seasons, benthic habitats, and estuaries, Glob. Biogeochem. Cy., 27, 1083–1095, https://doi.org/10.1002/2013gb004631, 2013. 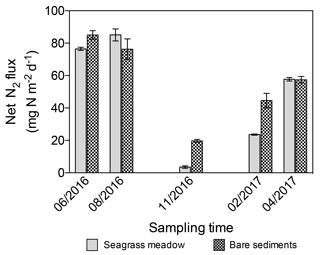 Eyre, B. D., Maher, D. T., and Sanders, C.: The contribution of denitrification and burial to the nitrogen budgets of three geomorphically distinct Australian estuaries: Importance of seagrass habitats, Limnol. Oceanogr., 61, 1144–1156, https://doi.org/10.1002/lno.10280, 2016. Falcón, L. I., Carpenter, E. J., Cipriano, F., Bergman, B., and Capone, D. G.: N2 fixation by unicellular bacterioplankton from the Atlantic and Pacific Oceans: phylogeny and in situ rates, Appl. Environ. Microbiol., 70, 765–770, 2004. Field, C. B., Behrenfeld, M. J., Randerson, J. T., and Falkowski, P.: Primary production of the biosphere: integrating terrestrial and oceanic components, Science, 281, 237–240, 1998. Fowler, D., Coyle, M., Skiba, U., Sutton, M. A., Cape, J. N., Reis, S., Sheppard, L. J., Jenkins, A., Grizzetti, B., and Galloway, J. N.: The global nitrogen cycle in the twenty-first century, Philos. T. Roy. Soc. B, 368, 20130164, https://doi.org/10.1098/rstb.2013.0164, 2013. Fulweiler, R., Brown, S., Nixon, S., and Jenkins, B.: Evidence and a conceptual model for the co-occurrence of nitrogen fixation and denitrification in heterotrophic marine sediments, Mar. Ecol.-Prog. Ser., 482, 57–68, 2013. Fulweiler, R. W., Heiss, E. M., Rogener, M. K., Newell, S. E., LeCleir, G. R., Kortebein, S. M., and Wilhelm, S. W.: Examining the impact of acetylene on N-fixation and the active sediment microbial community, Front. Microbiol., 6, 418, https://doi.org/10.3389/fmicb.2015.00418, 2015. Galloway, J. N., Aber, J. D., Erisman, J. W., Seitzinger, S. P., Howarth, R. W., Cowling, E. B., and Cosby, B. J.: The Nitrogen Cascade, BioScience, 53, 341–356, https://doi.org/10.1641/0006-3568(2003)053[0341:TNC]2.0.CO;2, 2003. Garcias-Bonet, N., Marba, N., Holmer, M., and Duarte, C. M.: Effects of sediment sulfides on seagrass Posidonia oceanica meristematic activity, Mar. Ecol.-Prog. Ser., 372, 1–6, 2008. Garcias-Bonet, N., Arrieta, J. M., de Santana, C. N., Duarte, C. M., and Marbà, N.: Endophytic bacterial community of a Mediterranean marine angiosperm (Posidonia oceanica), Front. Microbiol., 3, 342, https://doi.org/10.3389/fmicb.2012.00342, 2012. Garcias-Bonet, N., Arrieta, J. M., Duarte, C. M., and Marba, N.: Nitrogen-fixing bacteria in Mediterranean seagrass (Posidonia oceanica) roots, Aquat. Bot., 131, 57–60, https://doi.org/10.1016/j.aquabot.2016.03.002, 2016. Garcias-Bonet, N., Vaquer-Sunyer, R., Duarte, C. M., and Marbà, N.: Warming effect on nitrogen fixation in Mediterranean macrophyte sediments, Biogeosciences Discuss., https://doi.org/10.5194/bg-2018-373, in review, 2018. Gardner, W. S. and McCarthy, M. J.: Nitrogen dynamics at the sediment–water interface in shallow, sub-tropical Florida Bay: why denitrification efficiency may decrease with increased eutrophication, Biogeochemistry, 95, 185–198, 2009. Hansen, J. W., Udy, J. W., Perry, C. J., Dennison, W. C., and Lomstein, B. A.: Effect of the seagrass Zostera capricorni on sediment microbial processes, Mar. Ecol.-Prog. Ser., 199, 83–96, https://doi.org/10.3354/meps199083, 2000. Hemminga, M., Harrison, P., and Van Lent, F.: The balance of nutrient losses and gains in seagrass meadows, Mar. Ecol.-Prog. Ser., 71, 85–96, 1991. Herbert, R. A.: Nitrogen cycling in coastal marine ecosystems, FEMS Microbiol. Rev., 23, 563–590, 1999. Holtappels, M., Lavik, G., Jensen, M. M., and Kuypers, M. M.: 15N-labeling experiments to dissect the contributions of heterotrophic denitrification and anammox to nitrogen removal in the OMZ waters of the ocean, in: Methods in enzymology, Elsevier, Cambridge, Massachusetts, USA, 223–251, 2011. Howarth, R. W.: Nutrient limitation of net primary production in marine ecosystems, Annu. Rev. Ecol. Syst., 19, 89–110, 1988. Howarth, R. W. and Marino, R.: Nitrogen as the limiting nutrient for eutrophication in coastal marine ecosystems: evolving views over three decades, Limnol. Oceanogr., 51, 364–376, 2006. Isobe, K., Koba, K., Ueda, S., Senoo, K., Harayama, S., and Suwa, Y.: A simple and rapid GC/MS method for the simultaneous determination of gaseous metabolites, J. Microbiol. Meth., 84, 46–51, 2011a. Isobe, K., Suwa, Y., Ikutani, J., Kuroiwa, M., Makita, T., Takebayashi, Y., Yoh, M., Otsuka, S., Senoo, K., and Ohmori, M.: Analytical techniques for quantifying 15N∕14N of nitrate, nitrite, total dissolved nitrogen and ammonium in environmental samples using a gas chromatograph equipped with a quadrupole mass spectrometer, Microbes Environ., 26, 46–53, 2011b. Kennedy, H., Beggins, J., Duarte, C. M., Fourqurean, J. W., Holmer, M., Marbà, N., and Middelburg, J. J.: Seagrass sediments as a global carbon sink: Isotopic constraints, Global Biogeochem. Cy., 24, GB4026, https://doi.org/10.1029/2010GB003848, 2010. Kristensen, E., Penha-Lopes, G., Delefosse, M., Valdemarsen, T., Quintana, C. O., and Banta, G. T.: What is bioturbation? The need for a precise definition for fauna in aquatic sciences, Mar. Ecol.-Prog. Ser., 446, 285–302, 2012. McGlathery, K. J.: Seagrass habitats, in: Nitrogen in the Marine Environment, edited by: Capone, D. G., Bronk, D. A., Mulholland, M. R., and Carpenter, E. J., 2nd Edn., Elsevier Academic Press Inc, 525 B Street, Suite 1900, San Diego, Ca 92101-4495, USA, 2008. Meyer, R. L., Risgaard-Petersen, N., and Allen, D. E.: Correlation between anammox activity and microscale distribution of nitrite in a subtropical mangrove sediment, Appl. Environ. Microbiol., 71, 6142–6149, 2005. Moriarty, D. and O'Donohue, M.: Nitrogen fixation in seagrass communities during summer in the Gulf of Carpentaria, Australia, Mar. Freshwater Res., 44, 117–127, https://doi.org/10.1071/MF9930117, 1993. Nielsen, L. B., Finster, K., Welsh, D. T., Donelly, A., Herbert, R. A., de Wit, R., and Lomstein, B. A.: Sulphate reduction and nitrogen fixation rates associated with roots, rhizomes and sediments from Zostera noltii and Spartina maritima meadows, Environ. Microbiol., 3, 63–71, 2001. Nowicki, B. L.: The effect of temperature, oxygen, salinity, and nutrient enrichment on estuarine denitrification rates measured with a modified nitrogen gas flux technique, Estuar. Coast. Shelf S., 38, 137–156, 1994. Pedersen, O., Borum, J., Duarte, C. M., and Fortes, M. D.: Oxygen dynamics in the rhizosphere of Cymodocea rotundata, Mar. Ecol.-Prog. Ser., 169, 283–288, 1998. Pedersen, O., Colmer, T. D., Borum, J., Zavala-Perez, A., and Kendrick, G. A.: Heat stress of two tropical seagrass species during low tides–impact on underwater net photosynthesis, dark respiration and diel in situ internal aeration, New Phytol., 210, 1207–1218, https://doi.org/10.1111/nph.13900, 2016. Raitsos, D. E., Pradhan, Y., Brewin, R. J. W., Stenchikov, G., and Hoteit, I.: Remote Sensing the Phytoplankton Seasonal Succession of the Red Sea, PLOS ONE, 8, e64909, https://doi.org/10.1371/journal.pone.0064909, 2013. Raja, S., Thangaradjou, T., Sivakumar, K., and Kannan, L.: Rhizobacterial population density and nitrogen fixation in seagrass community of Gulf of Mannar, India, J. Environ. Biol., 33, 1033–1037, 2012. Salk, K. R., Erler, D. V., Eyre, B. D., Carlson-Perret, N., and Ostrom, N. E.: Unexpectedly high degree of anammox and DNRA in seagrass sediments: Description and application of a revised isotope pairing technique, Geochim. Cosmochim. Ac., 211, 64–78, 2017. Seitaj, D., Schauer, R., Sulu-Gambari, F., Hidalgo-Martinez, S., Malkin, S. Y., Burdorf, L. D., Slomp, C. P., and Meysman, F. J.: Cable bacteria generate a firewall against euxinia in seasonally hypoxic basins, P. Natl. Acad. Sci. USA, 112, 13278–13283, 2015. Seitzinger, S., Harrison, J., Dumont, E., Beusen, A. H., and Bouwman, A.: Sources and delivery of carbon, nitrogen, and phosphorus to the coastal zone: An overview of Global Nutrient Export from Watersheds (NEWS) models and their application, Global Biogeochem. Cy., 19, 368, https://doi.org/10.1029/2005GB002606, 2005. Thamdrup, B. and Dalsgaard, T.: Production of N2 through anaerobic ammonium oxidation coupled to nitrate reduction in marine sediments, Appl. Environ. Microbiol., 68, 1312–1318, 2002. Tibbles, B., Lucas, M., Coyne, V., and Newton, S.: Nitrogenase activity in marine sediments from a temperate saltmarsh lagoon: modulation by complex polysaccharides, ammonium and oxygen, J. Exp. Mar. Biol. Ecol., 184, 1–20, 1994.
van Luijn, F., Boers, P. C., and Lijklema, L.: Comparison of denitrification rates in lake sediments obtained by the N2 flux method, the 15N isotope pairing technique and the mass balance approach, Water Res., 30, 893–900, 1996. Vitousek, P. M., Aber, J. D., Howarth, R. W., Likens, G. E., Matson, P. A., Schindler, D. W., Schlesinger, W. H., and Tilman, D. G.: Human alteration of the global nitrogen cycle: sources and consequences, Ecol. Appl., 7, 737–750, 1997. Voss, M., Bange, H. W., Dippner, J. W., Middelburg, J. J., Montoya, J. P., and Ward, B.: The marine nitrogen cycle: recent discoveries, uncertainties and the potential relevance of climate change, Philos. T. Roy. Soc. B, 368, 20130121, https://doi.org/10.1098/rstb.2013.0121, 2013. Weikert, H.: Plankton and the pelagic environment, in: Red Sea, edited by: Edwards, A. J. and Head, S. M., Pergamon Press, Oxford 90-111, 1987. Welsh, D. T.: Nitrogen fixation in seagrass meadows: Regulation, plant-bacteria interactions and significance to primary productivity, Ecol. Lett., 3, 58–71, 2000. Welsh, D. T.: It's a dirty job but someone has to do it: the role of marine benthic macrofauna in organic matter turnover and nutrient recycling to the water column, Chem. Ecol., 19, 321–342, 2003. Welsh, D. T., Bourgues, S., deWit, R., and Herbert, R. A.: Seasonal variations in nitrogen-fixation (acetylene reduction) and sulphate-reduction rates in the rhizosphere of Zostera noltii: Nitrogen fixation by sulphate reducing bacteria, Mar. Biol., 125, 619–628, 1996. Welsh, D. T., Bartoli, M., Nizzoli, D., Castaldelli, G., Riou, S. A., and Viaroli, P.: Denitrification, nitrogen fixation, community primary productivity and inorganic-N and oxygen fluxes in an intertidal Zostera noltii meadow, Mar. Ecol.-Prog. Ser., 208, 65–77, 2000. Wilson, S. T., Böttjer, D., Church, M. J., and Karl, D. M.: Comparative Assessment of Nitrogen Fixation Methodologies, Conducted in the Oligotrophic North Pacific Ocean, Appl. Environ. Microbiol., 78, 6516–6523, https://doi.org/10.1128/aem.01146-12, 2012. Yoshinaga, I., Amano, T., Yamagishi, T., Okada, K., Ueda, S., Sako, Y., and Suwa, Y.: Distribution and diversity of anaerobic ammonium oxidation (anammox) bacteria in the sediment of a eutrophic freshwater lake, Lake Kitaura, Japan, Microbes Environ., 26, 189–197, 2011. Zarnoch, C. B., Hoellein, T. J., Furman, B. T., and Peterson, B. J.: Eelgrass meadows, Zostera marina (L.), facilitate the ecosystem service of nitrogen removal during simulated nutrient pulses in Shinnecock Bay, New York, USA, Mar. Pollut. Bull., 124, 376–387, 2017. Zhou, X., Smith, H., Silva, A. G., Belnap, J., and Garcia-Pichel, F.: Differential responses of dinitrogen fixation, diazotrophic cyanobacteria and ammonia oxidation reveal a potential warming-induced imbalance of the N-cycle in biological soil crusts, PloS one, 11, e0164932, https://doi.org/10.1371/journal.pone.0164932, 2016. Nitrogen (N) loads are detrimental for coastal ecosystems. We measured the balance between N losses and gains in a Red Sea seagrass. The N loss was higher than N2 fixed, pointing out the importance of seagrasses in removing N from the system. N2 losses increased with temperature. Therefore, the forecasted warming could increase the N2 flux to the atmosphere, potentially impacting seagrass productivity and their capacity to mitigate climate change but also enhancing their potential N removal.